Workers in open-style offices with only low-level noise experienced significantly higher levels of stress, made 40 percent fewer attempts to solve difficult problems, and made only half as many ergonomic adjustments to their workstations as did their colleagues in quiet offices. As a result, the VoiceArrest™ was designed with acoustic comfort in mind. Gone are the distractions that make it so difficult to concentrate. Gone are the worries about who is overhearing your confidential conversations. And gone is an office environment that adds stress and stress-related injuries to its employees’ lives! 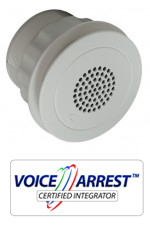 Through the use of true four-channel speech privacy technology, the VoiceArrest™ System simulates the gentle whooshing sound of a high-end HVAC system that covers conversations and other distractions. It’s like listening to quadraphonic surround sound—the sound is full, yet you can’t pinpoint exactly where it’s coming from. It uniformly blends into the office background virtually unnoticed—so natural that you won’t even realize it’s there.